I can’t help myself, I guess… | I'm Falling Apart! I bought a New Thing. It’s called a Guqin. It’s a Chinese seven-stringed zither and they’ve been around in their current form for maybe 5,000 years, which might as well be forever. Also pictured here are my condenser microphone (an AT2020) and my piezo microphone (the small orange bottlecap). Both combined get me a fairly decent reproduction of the instrument without costing me two large. The Guqin is still played these days by a small but dedicated group of people around the world. I’m not one of them, because I don’t really play it; what I do is so amateurish that it’s probably closer to abuse. I could go get lessons somewhere, but I’ve decided to practice with it until I can do some pretty basic things like hit the right damn strings. I’m not going to sugar coat this: I decided to try and find a Guqin after hearing the instrument played during the Jet Li / Donnie Yen fight scene in Hero. It’s not a glamorous story or anything. As an instrument, the Guqin is deceptive. Considering it has just slightly more than one octave in its default tuning, it seems like it should be very limited in range. But because the instrument is so receptive to artificial harmonics, you can get four octave’s worth of harmonics out of it without too much difficulty. I like to say that for every half hour I spend with this instrument I find something new and amazing, and that rate of discovery hasn’t slowed down yet in the two months I’ve owned it. The tuning pegs, located beneath the bridge. It’s also deceptive because you might mistake it for being relatively easy to play. But because the instrument is so specific and unforgiving, the difference between a perfect harmonic and a slightly mangled one is huge. 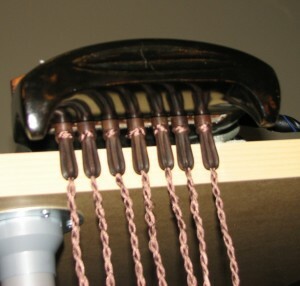 And while tuning using the pegs is fairly easy, if it’s not exactly in tune with itself the whole instrument will sound dead and sour because it is unable to generate proper sympathetic vibrations in the other strings. Physically it’s almost just a handful of strings stretched across the side of a tree. But the construction and configuration of a Qin are highly regimented and symbolic. 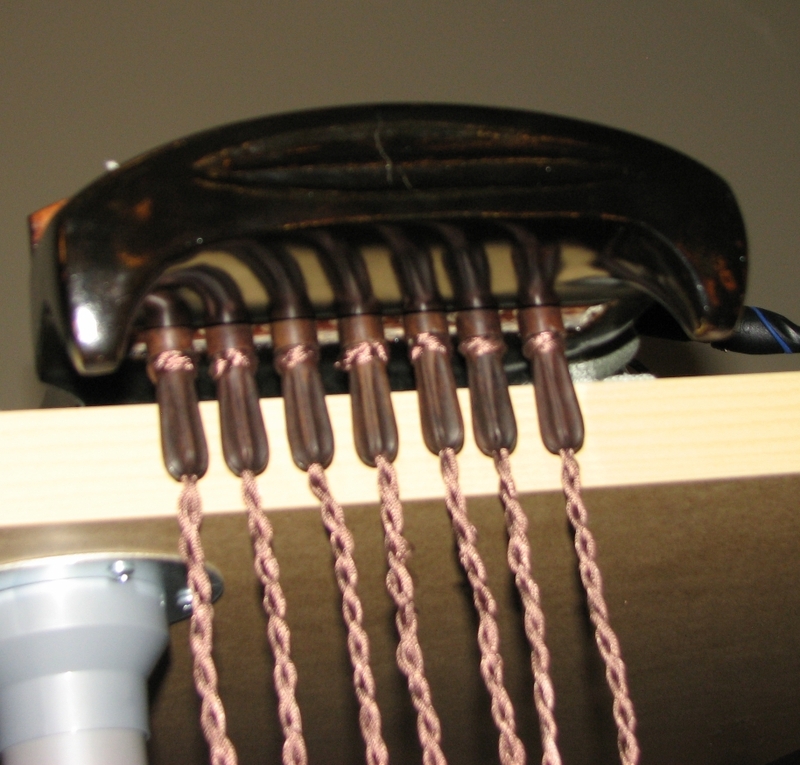 The underside of the Qin is where the two sound holes are positioned, which partly contributes to the instrument’s notoriously quiet tone. The two sound holes, known as the Dragon and Phoenix Pools. That low volume means that you won’t often hear the Guqin in large concerts or accompanying anything louder than a flute. Traditionally the instrument is played by itself, in a very meditative, free-form, almost tuneless sort of way. In fact, I’ve heard it said that traditional Qin music sounds like someone tuning up very slowly for six minutes, and that’s not a completely unfair observation. But that low volume that adds so much to the meditative nature of the Qin also means that it is easily drowned out by anything louder than a person speaking at natural volume. Also it means that, if you try to record it, you’ll have to use a very sensitive (or highly specialized) microphone and a lot of gain. 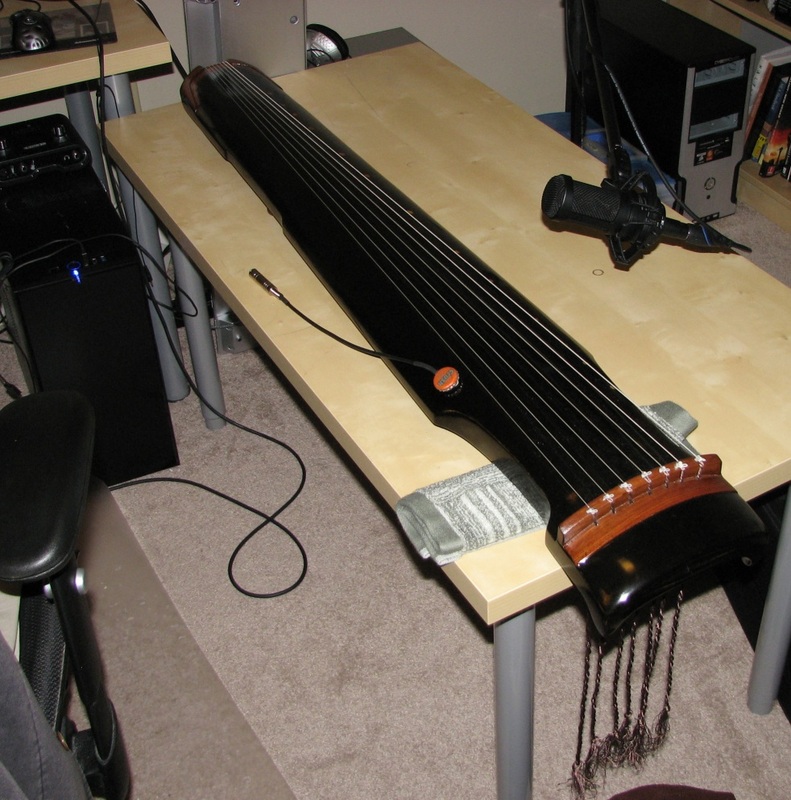 I have had to work extra hard on the instrument’s recordings because by the time I have the signal volume at an acceptable level you can also clearly hear me breathing behind the Qin, wheezing in feverish concentration with the effort of extracting something approaching acceptable. My goal with this instrument is to figure out a way to integrate it into the usual death metal I usually write. That sounds like a foolish idea, but a lot of metal is contrasted with acoustic or clean-tone electric instruments, and I think I might be able to find a way to fit this instrument into the mix. I don’t know if I can retain the Qin’s natural sound in the process, though. In fact the whole idea is so daunting that I’ve basically promised myself that I won’t get too upset if things don’t work out. Learning this new instrument has been an amazing experience, though. And it’s nice change of pace, having something to do with my spare time that isn’t video game related. I can’t deny the power of the instrument, either. It’s a very calming, soothing sound, and once you get warmed up it becomes incredibly easy to naturally pull ideas out of it the moment they enter your mind, which is a fantastic experience I’ve never had before. This entry was posted on Friday, June 15th, 2012 at 6:36 pmand is filed under . You can follow any responses to this entry through the RSS 2.0 feed. You can leave a response, or trackback from your own site.